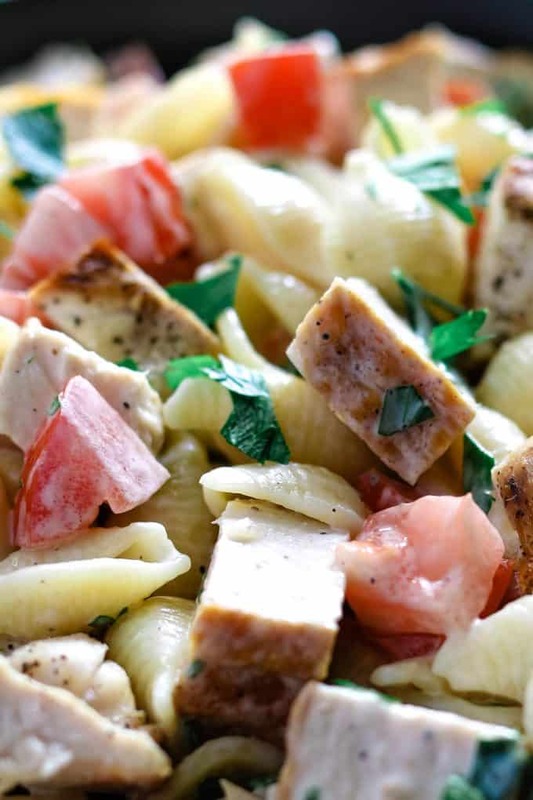 This grilled chicken ranch pasta salad is the perfect last minute side dish! It is perfect for summer – only 5 ingredients! 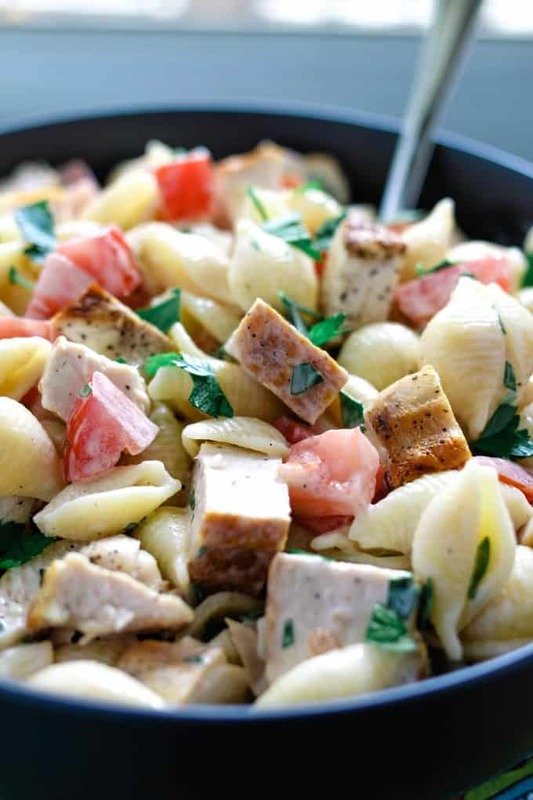 It is also great if you have a lot of leftover grilled chicken – cut it up and toss it in this pasta salad! 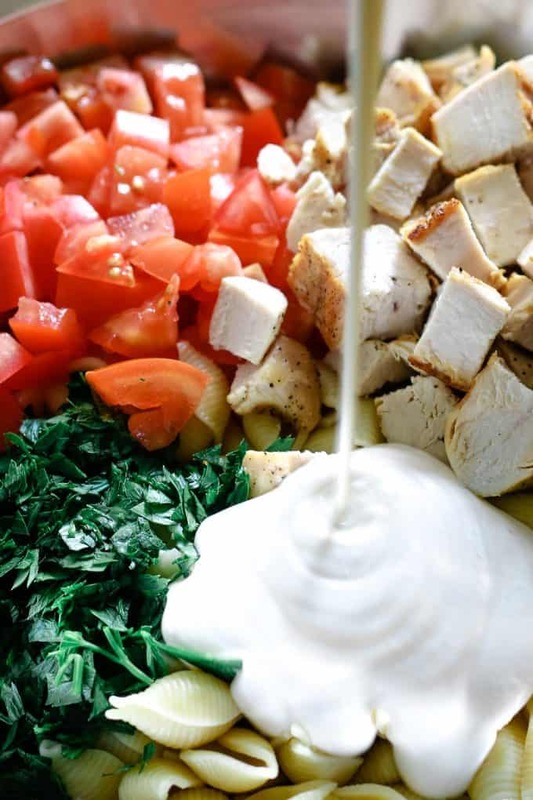 If you’re looking for an easy, budget friendly barbecue recipe, this grilled chicken ranch salad is it. 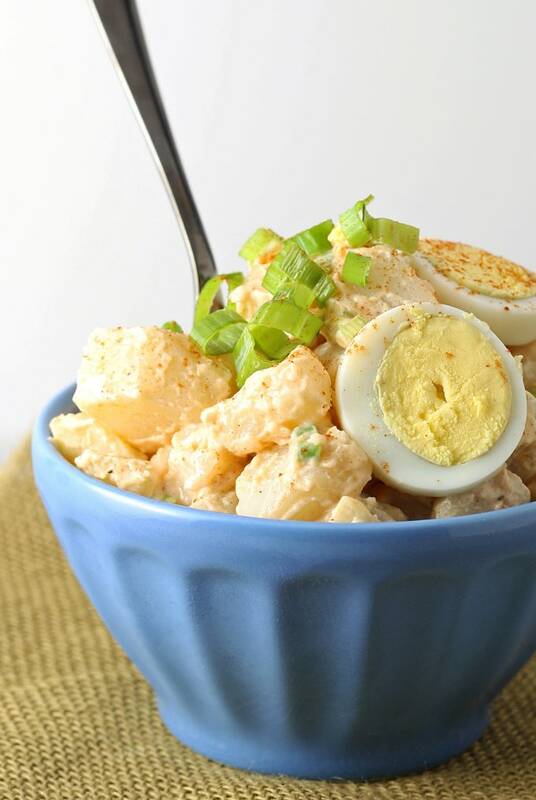 Only five ingredients, tossed together in a bowl and you’re ready to go. If you’re like me, a gathering of 10 can easily blow up to over 50 people. I always want to invite everyone I know and their friends too. 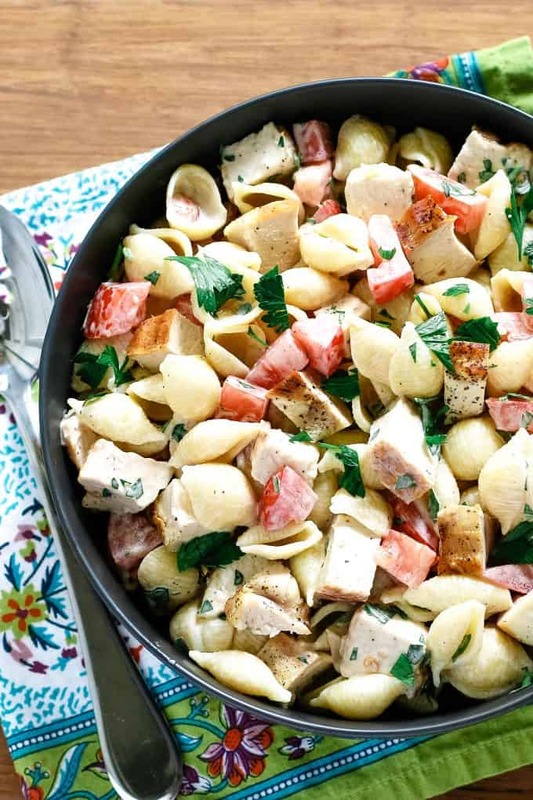 Grilled chicken ranch pasta salad to the rescue. This is my favorite chicken pasta salad with ranch. It could act as the perfect last minute dish for any party but I especially like it for summer events. Start with cooked chicken. Chop up the chicken while the pasta is cooling. Use this time to chop up the tomatoes and parsley too. Drain and rinse your pasta until it is REALLY cold. This may be the only time-consuming part of this recipe. You can serve this pasta salad warm but it’s not my favorite. 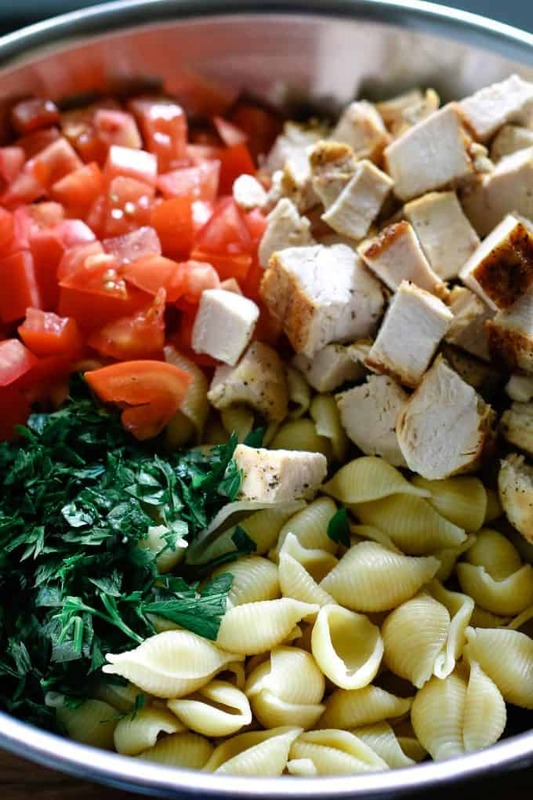 Once your pasta is cooled, add the chicken, tomatoes, parsley, and ranch dressing. We like our pasta salads to be light on ranch. If you want your pasta and chicken to have a thick creamy coating of ranch, add an additional 1/2 cup. Toss everything together and season with salt and pepper to your liking. This pasta salad is the perfect way to beef up a party menu. We have made this with rotisserie chicken, baked chicken, and grilled chicken. I am a sucker for a rotisserie chicken and every Friday my favorite grocery store has a $5 chicken sale. You can bet I am there every week. I strongly recommend going the rotisserie chicken route if you are short on time. Or you can do what I do – grab my George Foreman grill and walk out of the room. BAM again. Thanks indoor grill. What can I serve with ranch pasta salad? 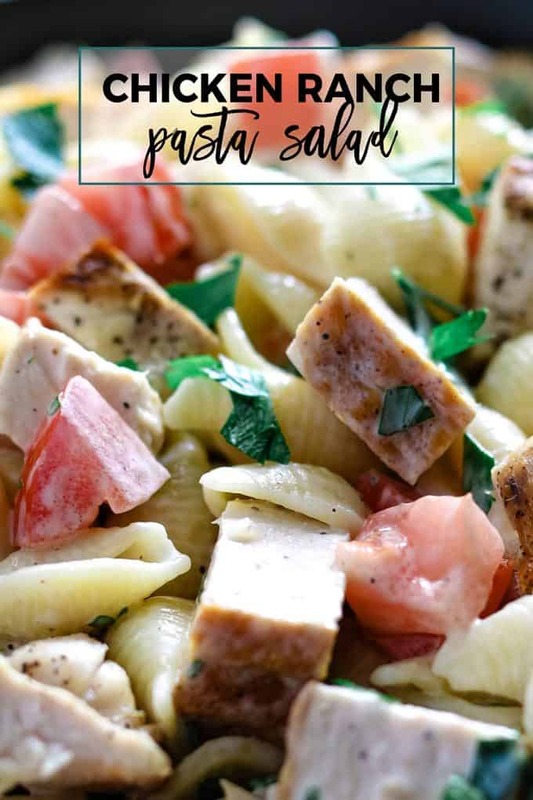 This grilled chicken ranch pasta salad is the perfect last minute side dish! It is perfect for summer - only 5 ingredients! 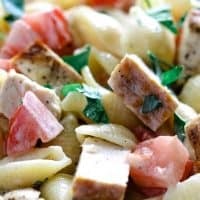 It is also great if you have a lot of leftover grilled chicken - cut it up and toss it in this pasta salad! Combine all ingredients in a large bowl. Mix well. Add salt and pepper to taste. Add an additional 1/2 cup of ranch if you want a thicker sauce. 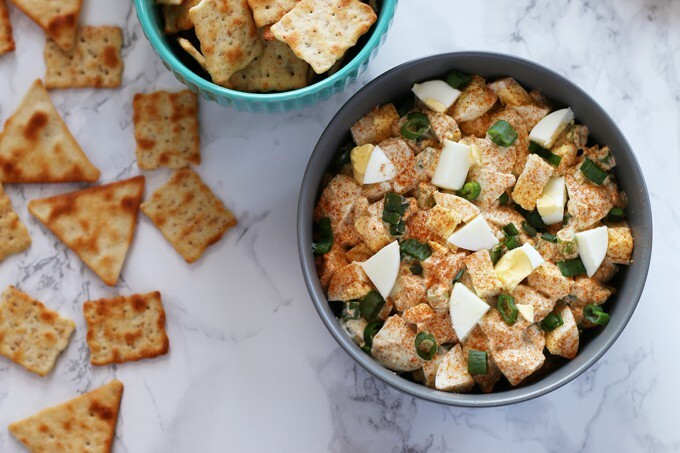 or this deviled egg dip! Wow – Looks really good! Thanks for sharing on What’s for Dinner! I almost always serve a pasta salad at our cookouts! I will have to try this one next time! This recipe looks awesome. Such a good dish for a BBQ or a party. I love ranch dressing. I’m like you – a big fan of the rotisserie chicken. This salad sounds so delicious…definitely one that I’ll have to try soon! Thanks so much for sharing your recipe with us at Share The Wealth Sunday! My mouth is watering – this looks amazing! So simple and so gorgeous! What a great way to stretch a bit of chicken!! Thanks for sharing this with us at Throwback Thursday this week! It’s simply the best when someone take all of my favorite foods and puts them together into a dish I haven’t seen before! Well done! This looks like a really easy quick and delish dinner! Thanks for sharing on the Bets of the Blogosphere linky party!